These areas of significant difference are indicated by the x’s in the map above. 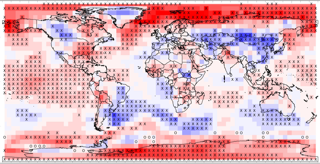 For example, the map shows that the IPCC projections are expected to be too warm (red x’s) over vast parts of the Pacific Ocean, the North Atlantic Ocean, and the Indian Ocean, while the opposite is true for the South Atlantic Ocean and the part of the Indian Ocean south of Australia. In contrast, the projected warming is expected to be underestimated (blue) over northwestern Canada and central Asia -- and a seasonal analysis reveals that this is primarily due to an underestimate of the warming in winter months. (Dark red indicates 3-degree Celsius model overestimate, dark blue 3-degree underestimate if CO2 is doubled). "Regional Climate Sensitivity and Historical Based Projections to 2100," by Hébert, R., and S. Lovejoy is published in Geophysical Research Letters.